It’s finally beginning to look like fall here in Italy. This trip started, as always in Rome. 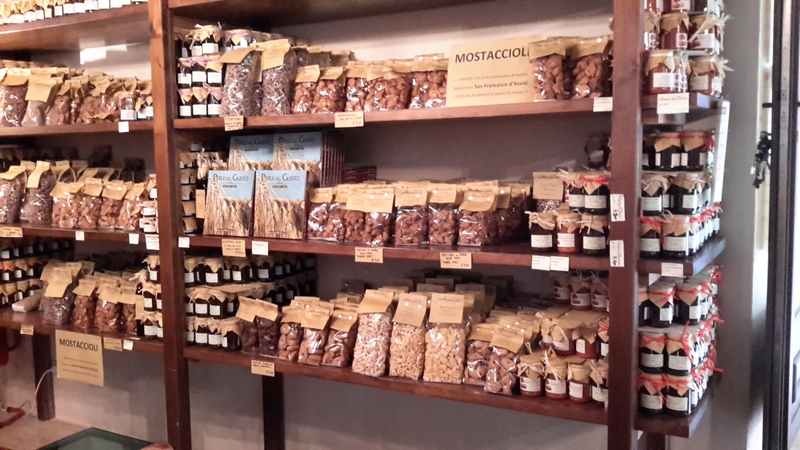 Then off to Perugia for some chocolate, a great beginning for any shopping trip. Perugia home of EuroChocolate festival. Surrounded by all that chocolate is a great way to spend the day. The EuroChocolate card (which was only 5 euro) got you a few free tastes of chocolate and a tazza (cup) of hot Ciobar chocolate! I found some really delicious hand made chocolates from Piemonte region that are well worth the cost. They are so heavenly you don’t care about cost or calories. The good news is that it takes so much less to satisfy a chocolate craving. And, the flavors . . . . beyond the peperoncino, the pistachio and the frutta di boschi, there are rosse arancio, some with hazelnuts, caffe and all are so good! I just put them all in a pile to consider what to eat first. Then I remembered those waiting for some great Italian chocolate and used great restraint. Mostly. OLIVE OILS MAY BE IN SHORT SUPPLY THIS YEAR. The impact of all the winter, spring and summer rains in Italy is being felt by the olive growers here. The olive oils I love (mostly olio nuovo) are almost non-existant this year. There was so much rain that the olives did not grow well, many too small to harvest and when that happens they get some kind of flies that make them unusable. I’ve worked really hard to come up with some great oils to bring back with me. There are some from Livorno, where they had a superb harvest this year. Umbria has only a few small providers with oil, but I managed to get a few of several types (moraiolo, and leccino). I’m off to the Maremma this week to see what is available there. Sabina, one of my favorite places for oil, apparently had no harvest from most of the trees this year. A disastro! Many of us will be using year old oil this year (which is fine since olive oil is best at less than two years old), but still, I’ll miss that brightness of flavor of the olio nuovo (as well as the higher levels of antioxidants). UMBRIA SHOPPING IS ALWAYS EXCITING. 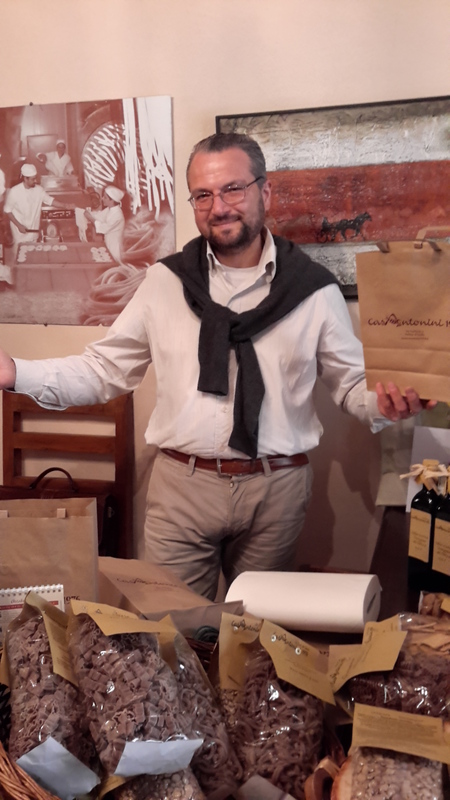 I love shopping in Umbria. So many wonderful food products in addition to some great olive wood utensils and fine linens. Tomorrow, we’re off to Farfa. I’ve been surprised that even some Romans don’t seem familiar withFarfa and it’s only an hour or so from Rome. The Abbazia (abbey) supposedly has some nuns making an outrageous marmelate (jams) and then I’ll be off to the Maremma for all those coastal specialties. If you are not already on my newsletter list, please send me a request to add your name to the list. I’ll send you a listing of what’s available and keep you up-to-date on upcoming offers. Email me at ExpresslyItalian@aol.com. 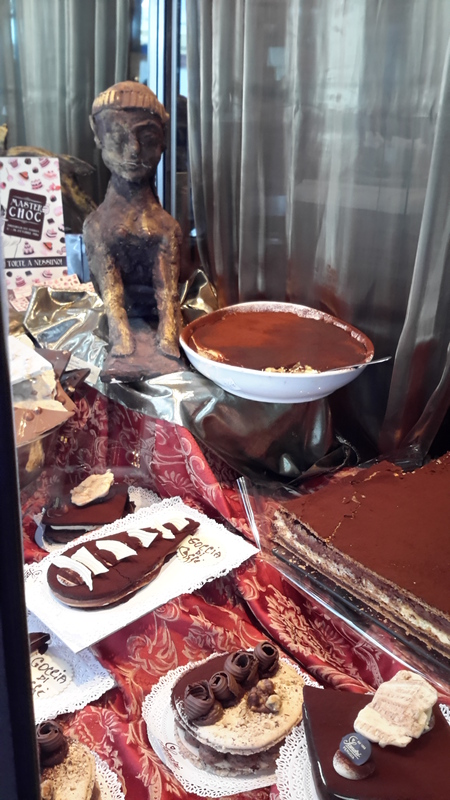 This entry was posted in Campo dei Fiori, Italian food, Italy, Maremma, Mauro Berardi, Rome, travel, Tuscany, Uncategorized and tagged Chocolate, Umbria. The pasticcio with drunken figs would be something I’d go crazy over! I wonder if the lack of olives harvested this year due to rain will cause the prices to go up? Nice post, you left me drooling! Your wondering is exactly right. So few areas are able to harvesthe this year there is almost no olio nuovo available. My normal source in Sabina did not harvest. Few in Umbria and Tuscany have any harvest either. All of which means prices will rise. I found Il Cavallino, an oil from Livorno which had an exceptional harvest year. But pickings will be slim, more expensive and mostly year old oils. And thanks for your comment.